Since the end of 2018, Air India has hit headlines for right reasons, including few new routes for nonstop flights to and from India. This Women’s Day 2019 Air India’s all-women-crew flights to the US, the UK, Australia and China set a record. Now Air India’s inflight menu served on international flights is all set to get a cooling makeover with an Indian feel and attention to passengers’ health this summer. 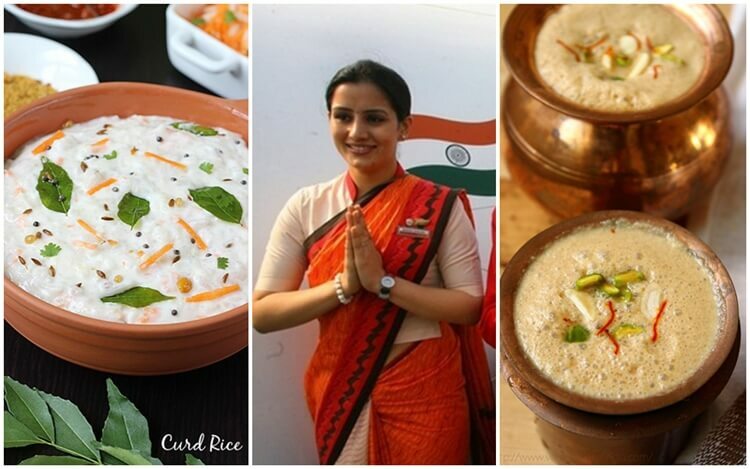 In order to mitigate the passengers’ concerns about its inflight services including onboard meals, Air India will introduce a new menu featuring curd rice, aam panna and jal jeera on flights to India from US cities, London, Sydney, Singapore, Canada, Toronto, China and others in its global network, starting on April 1. The flag carrier of India spends over Rs 800 crore on inflight food services annually. Air India’s new inflight menu replaces sweetened juices and cold drinks with traditional Indian summer drinks such as aam panna, jal jeera, masala lassi and butter milk to welcome international passengers on board. Fresh, flavored yoghurt will be served instead of sliced fruits for breakfast on all Air India flights to international destinations through summer 2019. The new menu also replaces bread rolls with croissants, and plain soft rolls with masala bread for breakfast. A two-course meal will be served, instead of the existing three-course meal, to the passengers of Air India flights on international routes, including San Francisco to Delhi, New York JFK to Delhi IGI, Chicago ORD to Delhi, Newark to New Delhi, London to New Delhi, and Sydney to Delhi IGI. Salad is removed to make way for mint green and ginger tomato chutneys in Air India’s new food menu for lunch / dinner. Starting on April 1, even those traveling on the cheapest Air India flights to India from USA, the UK and any other country will not be served fried food items. Instead, they will be treated to pao bhaji, vegetable upma, vegetable poha, ragda pattice and cutlets with high tea, with a traditional Indian flavor to their taste buds. “Complaints about the food served on board do often pour in from our customers flying Air India on long-haul flights. Hope, the new menu with curd rice, traditional summer refreshers and nutritious alternatives to fried snacks will help endear the airline to overseas Indians. I must say Air India’s new food menu promises a healthier and more delectable gastronomic experience on board,” said the chief customer relations officer of IndianEagle.com, a leading online travel booking portal. Air India, whose passengers can now bid for an upgrade to business from economy paying a fraction of actual business class fare, has added a variety of chutneys and homemade pickles to the new menu for First and Business travel classes. On Air India’s business class flights, round-the-clock coffee service will be provided. To the pleasure of most passengers, Air India’s new food menu comes with topnotch-quality Indian sweets. Desserts, either homemade or sold by renowned brands, will be served on board, irrespective of travel class.